The Pope on "conversi ad Dominum"
St. Gabriel's Parish, Stamford, CT.
Not exactly ‘ad orientem’? Or is it? 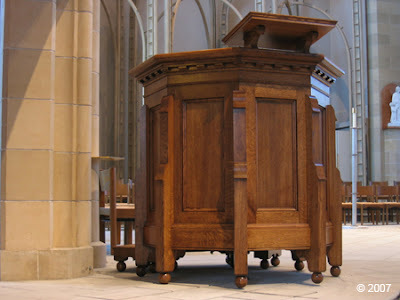 Cardinal Assesses Impact of "Summorum Pontificum"
A Papal Liturgy celebrated Ad Orientem? 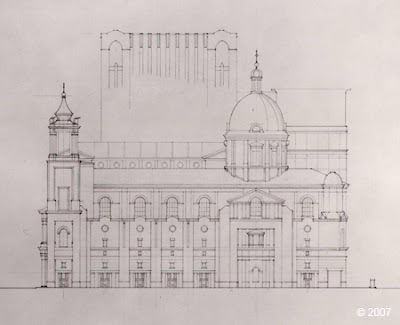 Mr. William Heyer has been introduced in these pages before, as he is the architect of record for the Shrine of Christ the King in Chicago, fleshing out the proposals prepared by the Institute's in-house designer, but he is becoming an important architect in his own right. 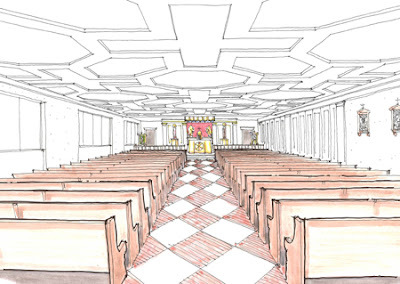 In addition to his restoration work at the Institute's new oratory in Kansas City, he has undertaken an extensive renovation of the Pontifical College Josephinum in Columbus, Ohio; this has limited itself so far to largely pragmatic concerns but there are plans to restore the college's chapel to a more traditional state. 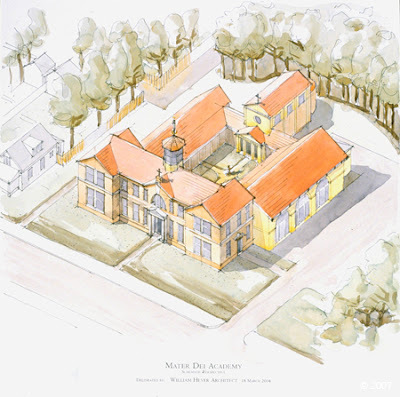 A small piece of this proposed beautification can be seen in the handsome ambo he has already designed for the college. 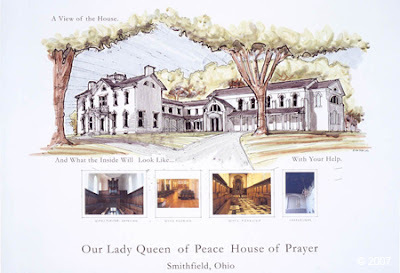 Another project was the beautification proposed for a basement chapel that has housed St. Stephen the Martyr parish in Ohio since 1963, an interesting approach to a difficult location. 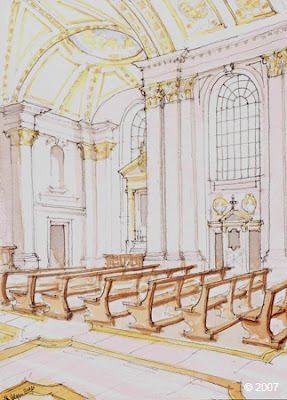 As more parishes look into overhauling their outdated modernist interiors, often low-ceiling'd and constrained in shape, such studies will increase greatly in their importance. 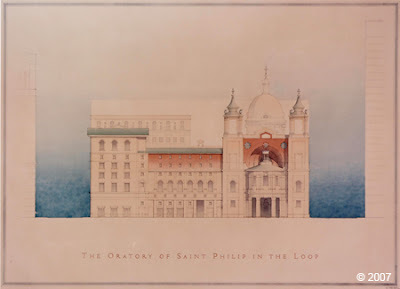 Heyer's thesis project from his time at Notre Dame was a fascinating proposal for an Oratorian foundation in Chicago, St. Philip's-in-the-Loop, an exploration of simplified Borrominian motifs in an American setting, developed with considerable grace and ingenuity. 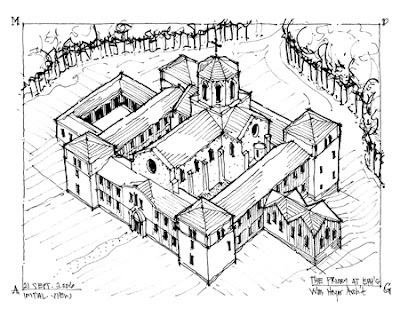 Notice in particular the ingenious narthex with its second-story Oratorium Parvum. Photos of several other projects follow. 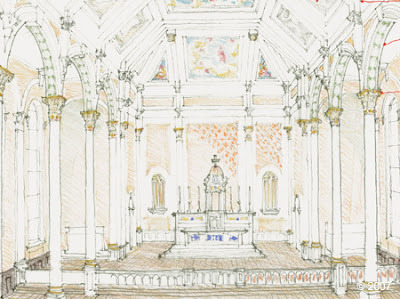 St. Patrick's Oratory, Kansas City, proposed interior beautification. 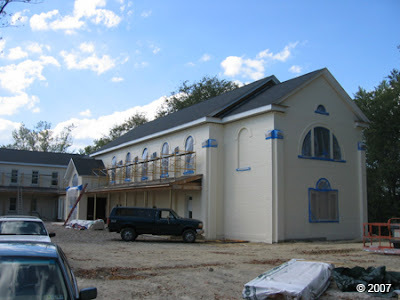 Priory of Our Lady of Ephesus, St. Joseph, Missouri.